Pleasure boats have always been affected by some regulations, for example all vessels must follow the International Rules for the Prevention of Collisions at Sea (COLREGS). Regulation 19.2.1.7 – Radar Reflectors All ships shall have, if less then 150grt and if practicable, a radar reflector. RYA Note: The Department of Transport and the Local Regions has given a definition of “if practicable” as, “if it is possible to use a radar reflector on your boat then you must use one”. MCA guidance says that if your boat is bigger than 15m hull length, you should have a radar reflector that complies with the IMO performance standard (ie the reflector should have a radar cross section (RCS) of 10 square metres). Check with the supplier or manufacturer before you buy. If your boat is less than 15m in length, you should fit the largest radar reflector (in terms of RCS) that you can. Whatever size your boat is, you should fit the reflector according to the manufacturer’s instructions and as high as possible to maximise its effective range. Regulation 29 – Life saving signals An illustrated table describing the life-saving signals shall be readily available on board. RYA Note: This table is printed in the RYA Boat Safety Handbook (code C8 – buy it from the RYA Shop on-line ) or as a free MCA leaflet (contact RYA Cruising to be sent one free of charge). It is also reproduced in the RYA Magazine, Winter 2002 edition and in a number of other yachting magazines. The regulation requires that a copy of the table is easily to hand on board when at sea. Regulation 31 & 32 – Danger Messages Skippers and Masters have a duty to communicate information on navigational dangers. These include dangerous derelicts or other dangerous obstructions, tropical storms and winds of force 10 or more for which no warning has already been received. The information can be sent via plain language or using the International Code of Signals. Governments are also required to promulgate any danger information received and messages must be free of charge to ships. RYA Note: In practice this means that we must let the Coastguard and any other vessels nearby know if we encounter anything that could cause a hazard to navigation – if it has not already been reported. You can do this by calling the Coastguard using VHF radio (if you have it on board) or by telephoning them as soon as you can. The Coastguard will then warn other ships in the area. Regulation 33 – Distress Messages Masters and Skippers have an obligation to respond to distress messages from any source. Ships can be requisitioned by the master of a ship in distress or the Search and Rescue authorities. RYA Note: This basically means that you must respond to any distress signal that you see or hear and you must help anyone or any boat in distress. 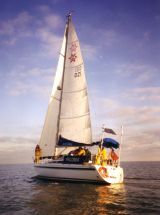 Regulation 34 – Safe Navigation and avoidance of dangerous situations (including passage planning) “Going to sea” is defined as proceeding outside of ‘categorized waters’ (most of the Solent area counts as categorised waters). MCA guidance notes say for “small craft and pleasure vessels, the degree of voyage planning will be dependent on the size of the vessel, its crew and the length of the voyage. RYA Note: This is all about pre-planning for boating trips. It is basically common sense and has always been considered as seamanlike good practice. There is no need to complete forms or write a long, formal plan, but you may find it useful to jot your passage plan down in the log or in a notebook. Anyone who has completed an RYA practical training course will be competent in passage planning. Click to find out about RYA Training Courses. WEATHER – check the weather forecast and get regular updates while you’re out on the water. TIDES – check the tidal predictions for your trip and make sure you take them into account. LIMITATIONS OF YOUR BOAT – is your boat up to the trip? Have you enough safety equipment and stores on board? CREW – take into account the experience and physical ability of your crew. NAVIGATIONAL DANGERS – make sure that you are familiar with any navigational dangers you may encounter on your trip. This generally means checking an up to date chart and pilot book or almanac . CONTINGENCY PLAN – take the unexpected into account and have a plan for what you can do if something goes wrong. This includes bolt holes or ports of refuge. Don’t be over reliant on your GPS set and make sure you can navigate to safety should it or your power source fail . INFORMATION ASHORE – tell someone ashore where you’re going and what your plans are. Let them know what they should do if they become concerned for your safety. Consider joining the Voluntary Safety Information Scheme (CG66) – it’s free, and it could save your life by saving valuable time should the Coastguard need to help you. You can download the forms from the RYA web site. The MCA has said that they only expect passage planning in proportion to the trip undertaken and do not require any kind of formal written passage plan to be submitted. This regulation is not to be confused with the MCA’s Voluntary Safety Identification Scheme (CG 66), which allows boat owners to register their vessel and, prior to a passage, give details of their boat, destination and ETA to the Coastguard in case of an emergency. Regulation 35 – Distress Signals Distress signals are only to be used for their proper use. RYA Note: Fines already exist of the misuse of distress flares. By misusing distress signals you could put your own or someone else’s life at risk. While this is not a fully detailed list it is an illustration of some of the legal requirements.